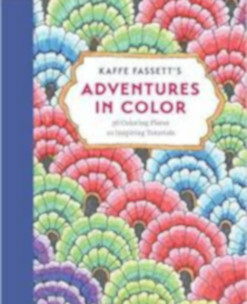 Kaffe Fassett has inspired thousands of people around the globe with his colorful work in fabric, knitting, needlepoint, patchwork, painting, and mosaic. He is widely acknowledged as a visionary in the use of color and pattern. With his coloring book, Fassett shares 36 pieces of his own beautifully rendered line art plus 10 color tutorials complete with samples he created himself. Inspired by his travels around the globe, Fassett’s line art ranges from Japanese kimonos, Turkish palaces, and ikat robes to French coffee bowls, pansies, hollyhocks, cats, cockerels, his own fabric and needlepoint collections, and much more.